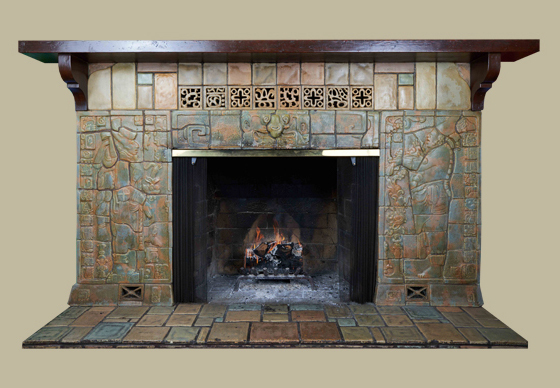 The Two Red Roses Foundation adds to its collection of Arts and Crafts fireplaces a rare Mayan Revival fireplace made by Calco, South Gate, California (1923-1932). Under owner Rufus Bradley Keeler's direction, Calco made several Mayan revival fireplace sets. Over the past 25 years, the Tile Heritage Foundation and Riley Doty, a ceramic tile setter and tile historian, have discovered four of them in the Bay Area, including this one at Montclair Women's Club in Oakland. The Club will be sold in the summer and TRRF is delighted to have the opportunity to preserve this historical fireplace. "At Palenque (southern Mexico), there are three small temples facing one another around a small plaza - the Temple of the Sun, The Temple of the Cross, and the Temple of the Foliated Cross. Keeler's fireplace is based on the panels of the Temple of the Cross. 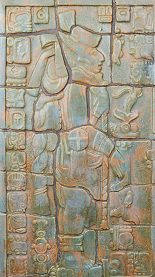 The original carving was removed from Palenque decades ago so that it could be displayed in The National Museum of Anthropology in Mexico City, where it still resides." 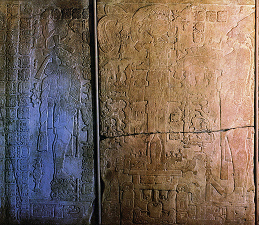 Above: Images of the panels found at the Temple of the Cross that provided inspiration for Rufus Keelers Mayan Revival fireplaces. 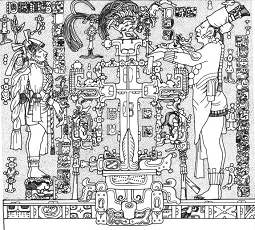 Right: Line drawing of the Palenque panels showing all design details. "For centuries it was customary to plunder archeological sites for choice pieces to display in preeminent museums. In the 1920s, U.S. newspapers and magazines carried stories of the discoveries of Mayan ruins in the jungles of southern Mexico. "Mayan Revival" became a new design source which many found refreshing, following a long period in which nearly all design had been rooted in European sources and vocabulary." Certainly the most stunning Mayan fireplace built by Calco is the monumental set Keeler built for his own house in South Gate. The house has been preserved practically untouched and in its original beauty by its current owner, Brian L. Kaiser, who writes: "Each room has floor tiles of a distinct color and pattern with ceramic baseboards enhanced with wisteria, clematis, and yellow roses." 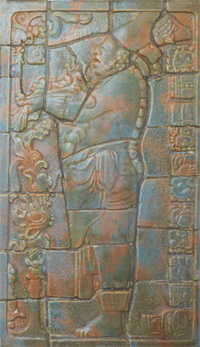 Kaiser adds, "Keeler liked creating new glazes, rich and brilliant colors, in stark contrast to the muted, somber tones of tile makers like Batchelder. He was deeply concerned with the quality of his clay mixture and the manner in which the tiles were fired". For more information on Calco and Rufus Keeler, see Joseph Taylor's California Tile: The Golden Era, 1910-1940. Acme to Handcraft, pp. 94-109, and The Arts and Crafts Movement in California: Living the Good Life, pp. 120-121, 124. 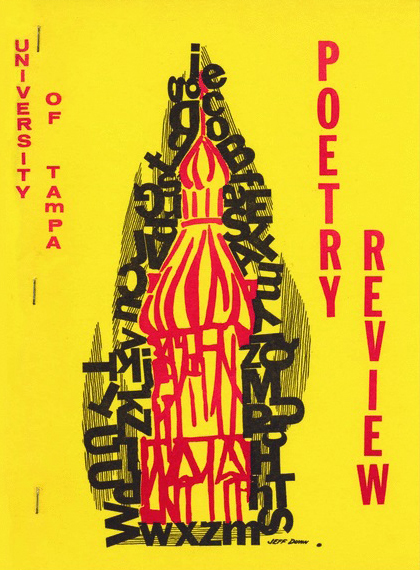 Cover of the first issue of the Tampa Review designed by Jeff Dunn. It depicts the image of a minaret surrounded by the alphabet which suggests the connection between literary arts and the very structure of the educational mission of the university. The Tampa Review is the prestigious University of Tampa's faculty-edited literary journal, the oldest literary journal in Florida, and the only hardback literary journal in the United States. The Tampa Review publishes literary work that exemplifies culture rooted in the community, but is also in touch with global arts that embrace literary and artistic traditions and inform and sustain current culture. TRRF library owns a complete run of the Tampa Review, which was first published in 1964. Working in collaboration with Richard Mathews, Ph.D., Tampa Review Editor, a selection from the TRRF's collection will be featured on the front cover and dust jacket and throughout the journal for their 50th Anniversary issue. In addition to the usual eclectic variety of poems, short stories, and essays, a special section will be dedicated to TRRF, its mission, collection, and commitment to building MAACM. 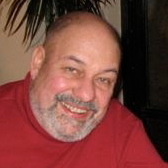 There is also a digital complement, Tampa Review Online, that will expand on the featured article. Since TRRF is lending more than 60 objects to an exhibition at Tampa University's Henry B. Plant Museum, the timing of both projects coincides perfectly. Bowl, Edith Brown and Fannie Levine, 1914, 11 &frac58;" diameter, Saturday Evening Girls, Boston. 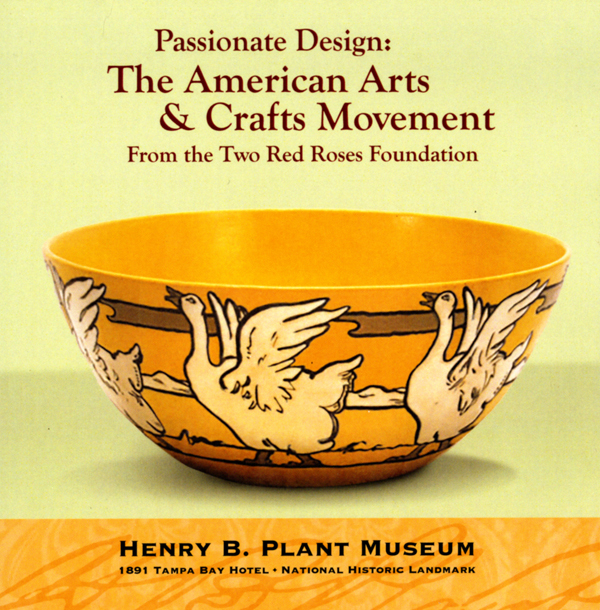 The exhibition, Passionate Design: American Arts & Crafts From the Two Red Roses Foundation, brings together selections of pottery, metalwork, lighting, block prints, tiles, and furniture from the TRRF collection. The Foundation is pleased to support this important exhibition being held at the historic Henry B. Plant Museum and has lent sixty-nine diverse examples from its collection for display, several of which have never been seen by the public before. This gesture is yet another example of TRRF's commitment to its mission of promoting an understanding of the American Arts and Crafts Movement through education and exhibition. Passionate Design runs from March 2015 to December 2015, and the anniversary issue of the Tampa Review published later this spring. TRRF was honored to receive a very welcome donation of books, catalogs, and ephemera from Mr. Ray Groll, dealer, author, and Arts and Crafts metalwork expert long recognized as one of the "originals." Notable amongst his donation are complete sets of The Fra magazine and the "Little Journeys" series, published by Elbert Hubbard and the Roycrofters of East Aurora, New York. The foundation's library relies on your generosity and donations of books and ephemera. As a charitable institution your contributions are tax-deductible.